With the 307, InWin unveils what’s essentially an updated version of the current 303 case. The front panel features numerous RGB LEDs which can be used to create animated images. The case is already available in Asia and should hit the EU-zone this month. The In Win 307 comes with a simple and sleek design and there are no special air-vents present that could have an impact on the looks. Everything has been kept as clean as possible, which was also the case with the previous model. One of the two panels of the In Win 307 is made entirely from solid tempered glass. Apart from that the front-panel features numerous RGB LEDs, which basically form a programmable LED wall. 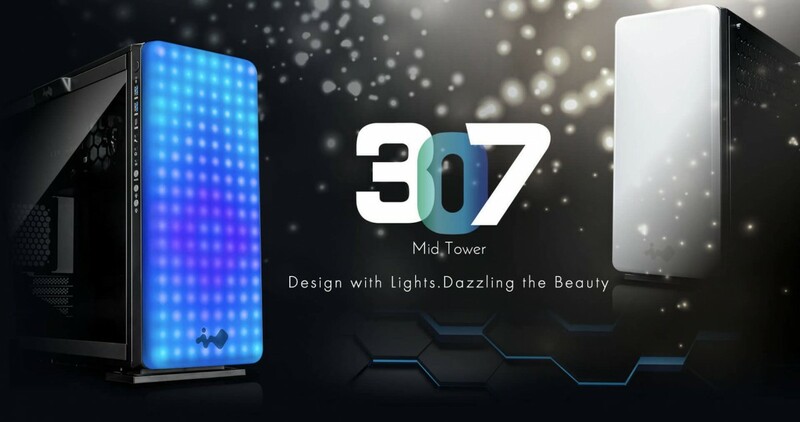 InWin supplies its Glow software featuring 12 pre-programmed settings that will let you display the time, animated clouds, candle light, and more. This case is compatible with ATX, mATX and mini-ITX form factor motherboards. The HDDs as well as the power supply have been hidden away behind the motherboard tray. Additionally there is space for two more 2.5" devices on the back of the motherboard tray. Cooling wise, you can install a 360mm radiator in the top and another 120mm at the rear. It's not the first time that InWin comes up with such a great idea, as its "Infinity LED" feature was great looking as well. Checking the price the InWin 307 seems to cost approximately 280 to 300 Euro.